The educational copyright site I’ve been working on with some of our media resource teachers is now pretty much done. I’m fairly satisfied with it. It addresses a lot of information pretty succinctly and no one is called a thief or a criminal. I’m proud of that. 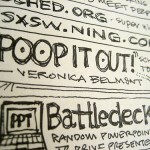 I’ve also got a powerpoint presentation that is pretty slick looking (if I do say so myself). There’s not much for text on the slides but the notes are pretty packed with information. Both the website and the presentation stick to the “what can you do?” vibe as much as possible and stress the options you have with Creative Commons and public domain works. It’ll be interesting to see if it makes any real difference. I did try to keep things humorous and all photos are Flickr based under a CC license. I don’t know who did it but there’s a great bad powerpoint version of the Gettysburg Address. It summarizes the points in an effective, and humorous way. The students would create the notes the speech makers would need, set the agenda etc. Everything a really bad business powerpoint user would need. This is a great way to really explore a famous speech or historical document. You’d have to really examine the document/speech, the speaker etc. The key would be NOT to have them present for real but demo the presentation to the class explaining why they chose certain aspects of the presentation etc. It’d be a lot of fun and require lots of deep processing to make it funny. I’d love to see a bad powerpoint version of Macbeth’s soliloquy or The Constitution etc. Great tool to have in my teacher toolbox for staff development, and could probably be effectively used with the kids too. THX! Once again Tom, you amaze me with the materials you concoct. I’m really hoping that I have an excuse to attend NECC next year, but if I don’t, I’m going to recommend you to my state’s ed tech orginzation (MACUL) to consider you as a featured speaker. Your visually driven examples and tools are perfect for the less than savvy teachers when it comes to technology. Nice preso! I am looking forward to delving further into this one. Thanks for offering it up for our consumption. I’m glad you liked it. I’m no fan of copyright so I tried to make it a little less painful. 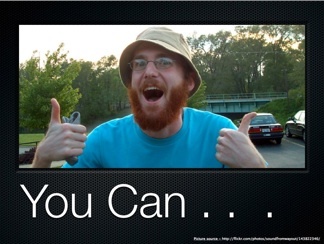 It would be awesome to come speak at MACUL, mainly just to get a chance to meet you in person after all this time. It’s still a little odd to me that I have multiple friends that I’ve never met. I’m not sure I’ll be at NECC myself. I’m about to make a job change and I’m not sure about the whole conference part yet. I’m headed to the Univ. of Richmond to try my hand at getting college profs. to use this stuff. It should be interesting. I’m looking forward to it but I’m also somewhat sad about leaving my district. 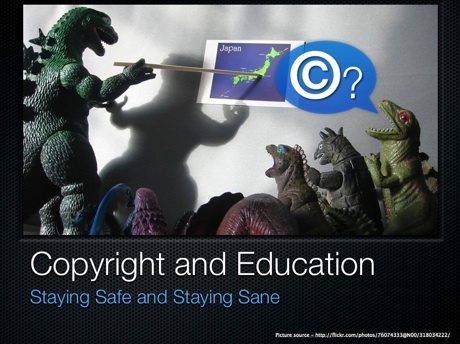 Copyright awareness is something that we as teachers must include in our classroom life. I teach a range of children from K-6 and I begin copyright instruction in kindergarten, by modeling behaviors such as “acknowledging” or “thanking” the creator of any work we make, talk about, or use. Someone always owns the work. (Picture, poem, song, etc). The owner of the work is the one who created it. By year 6 the children are not only aware of copyright and ownership issues, but have become quite good at referencing pictures, sound clips, and text. (I insist that they do so). 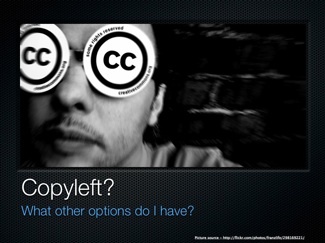 Tom Woodward at Bionic Teaching has a stylish powerpoint presentation on copyright. Check it out, it’s of the best I’ve come across on this vital topic. Tom keeps it positive using the traffic light analogy. Green is “you can” , orange is “caution”, and red is “do not”. By focusing on the green lights, like creative commons and public domain, you can be sure to avoid the scrutiny of the copyright police. The presentation is clear with ample notes, and covers images, text, sound, and video, in a very positive and simple way. Well worth adding to your toolkit. Very nice presentation on a complex subject. I am interested in this because, I have a small language school in Thailand and shudder when I see all of the blatant copying going on. (Though I will admit, I have probably done some of it, myself–It’s the environment!–he huffed and puffed! a compliment from a transplanted Ohioan to Virginia to Thailand. Then I had students use commons-licensed images in the PowerPoint presentations they were making for their history class. Also, a detail: The WP theme on your copyright web site is fine on Firefox but broken on Safari.